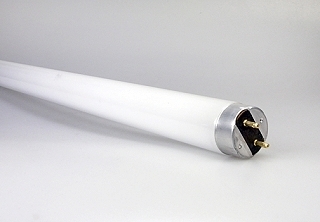 The Arista High Output UV Light Source Replacement Bulb is a 36 inch F-30 T-8 bulb that runs at a peak wavelength of 370nm. It is for replacing lamps in the UV EXPOSURE SECTION of the Arista UV Light Source 30x36. Standard output replacement bulbs (item #2630369), are also available for a lower cost and longer exposure times. If exposure consistency is problematic, it is recommended to install an entire set of 8 bulbs, when a bulb burns out or their strength begins to diminish. For replacing the LIGHT TABLE (TOP) bulbs, please see item #2630365.